I’m very excited to be performing with composer and pianist Wendy Hiscocks at the Holywell Music Room on Wednesday 10th October, 7.30pm, and to be performing a world première of her new work for cello: Songlines. This will be a concert celebrating the music and creativity of women composers and musicians from the nineteenth century to the present day. We have selected a fascinating range of music for cello and piano including pieces by: Fanny Mendelssohn-Hensel, Lili Boulanger, Elisabeth Lutyens, Rebecca Clarke, and living composers Errollyn Wallen, Ann Carr-Boyd, Liza Lim and Wendy Hiscocks. We will also be presenting a brief life story for each of the women featured, showing the ways in which they may have struggled to be recognised for their talents in a male-dominated industry (for example, Rebecca Clarke had to contend with rumours that she didn’t exist, and that her work was actually composed by Ernest Bloch!). We have called the concert Invisibility to highlight exactly this prejudice that women faced. 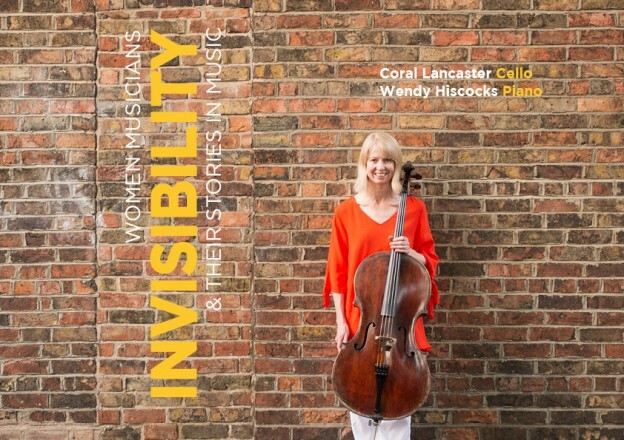 Invisibility is also the title of a solo cello piece that I will be performing by Australian composer Liza Lim, which was inspired by the women singers of the Yolgnu Aboriginal group in northern Australia. The piece explores the Yolngu concept of ‘Dreamtime’ and ‘hiddenness’, in layers of shimmering textures and colours of sound. This entry was posted in Cello, Concerts on September 20, 2018 by Coral.